The standard narrative about China is that common people are seeking change and it’s the government that’s standing in their way. Chinese people protest; Chinese authorities back down; and as demonstrations grow, so does the possibility that Beijing will be confronted with too many protests than the Chinese Communist party can cope with, and will be compelled to reform quickly or lose power. However, the local reality on the ground is far more complicated, as events in Nanjing, the capitol of Jiangsu province, showed this past weekend. On Friday last week, Beijing announced that the way the results of China’s annual national examination for college admission were tabulated would change. Jiangsu, one of the country’s more educated and affluent provinces and home to many leading universities, would have to give up 38,000 openings heretofore allocated to the province’s students to fill. The current examination system affords students from urban areas a significant advantage in how the examination scores are calculated and slots at universities are distributed. Many officials have been arguing for years that the current system discriminates against less prosperous provinces in China because those regions have been focusing on short-term employment and industry at the expense of education. While Jiangsu wasn’t the only province made to sacrifice, officials here have been especially unenthusiastic about reforms to the student selection system, because it makes their region more attractive to educated residents to buy property or remain here after they graduate. Jiangsu officials lost the argument. And their constituents weren’t happy. The announcement of changes stunned many parents and students in Jiangsu (as well as teachers and tutors there), all of whom--like their counterparts in other regions--spend enormous energy every year preparing for what is essentially the only route for Chinese youth to be admitted into national colleges and universities. Some parents began protesting at local schools in Nanjing almost immediately. Within hours, China’s social media also erupted in anger at the changes, as did local populations in Nanjing and some other cities in Jiangsu the following day when hundreds took to the streets and demonstrated outside government offices. Videos posted online show that the protests were loud but peaceful, in contrast to a number of previous episodes elsewhere in China. Within a very short period of time of the demonstrators assembling, provincial-level officials appeared before the crowd in Nanjing and promised to hear complaints about the new policy. A few hours later, faced with public opposition, Jiangsu officials promised publicly that there would not be any change to the number of slots available to students in the province, at least for the time being. On the surface, the events in Jiangsu appear to confirm the classical narrative of a restive and distrustful public rising up against Chinese authorities, and officials being forced to back down—perhaps even offer a model for future political change in China. So long as demonstrators have will and determination, the government will be compelled to concede. But that’s misinterpreting what actually occurred. Protests in China like the one in Nanjing rarely start spontaneously; they have to be carefully and quietly organized—something that’s simply impossible to do these days given the heavy monitoring by the government. Indeed, local accounts of the demonstrations indicate that the security forces and the cordon around government offices were actually there before the protests commenced. At the very least, Nanjing authorities knew something might happen and prepared for it. In fact, it’s likely that some dissident Nanjing officials, themselves angry at Beijing’s decision, were not entirely displeased to see signs of public fury. They may well have been out to use that anger as a means to pressure Beijing to allow local government to back away from a policy that they themselves didn't like, and knew wouldn't be at all popular. 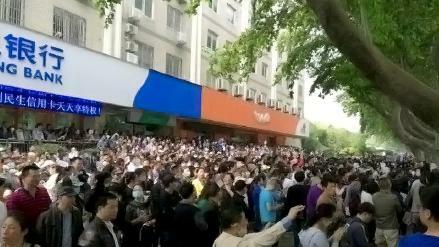 It’s also important to note that the protest in Nanjing never turned ugly. The demonstrators themselves seem to have been mostly parents, teachers, and educational administrators, who stood with placards outside the headquarters of the provincial government and shouted, but did not move to break the barricade, force confrontations, or threaten to occupy government offices. Nor did the security forces move aggressively to break up the protests. Both those protesting and those protecting understood that Nanjing’s government has usually looked to dialogue instead of force to deal with local demonstrations. While many observers argue that Chinese residents are clamoring for rights, a growing number of Chinese officials understand that the issue for many citizens is more often just the right to be heard. One reason for this mutual restraint is that the protestors weren’t interested in forcing political change or resignations, just a shift in policy. The protests in Nanjing weren’t about changing to something new, but preserving something old. As united as the demonstrators might have been for the moment, their protest was about something that benefitted them individually—an advantage that they are simply not willing to share with others less fortunate elsewhere. And like many rallies elsewhere in China, the demonstrations were aimed at supporting the previous status quo, not seeking to upend the existing order. We need to recognize that on the 50th anniversary of the Cultural Revolution there are no rebellions or large-scale revolts on China’s horizon; that political change in China these days is local and mostly peaceful. Governance is overwhelmingly by directive, with citizen participation appearing only when new policies take away old privileges. That may be comforting for some observers, but it’s also discouraging for those Chinese officials and residents who want greater transparency and trust. The recent events in Nanjing show how far away from those goals so much of China remains.